Russia on Saturday announced initial plans to build a new orbital space station together with NASA to replace the International Space Station (ISS), which is set to operate until 2024. Russia and NASA recently agreed to keep operating and financing the ISS until 2024, but future joint space projects have remained in doubt, as relations between Russia and the US have plunged to post-Cold War lows over the Ukraine conflict. "Roscosmos together with NASA will work on the programme of a future orbital station," the head of Russia's Roscosmos space agency, Igor Komarov said, quoted by Interfax news agency. Komarov made the announcement flanked by NASA administrator Charles Bolden at Russia's Baikonur launchpad in Kazakhstan. "We agreed that the group of countries taking part in the ISS project will work on the future project of a new orbital station," Komarov said. The Russian space chief said that the project to build the new station would be "open" and could include countries that are not currently involved in the ISS. "The first step is that the ISS will operate until 2024," he added. Russia had threatened to pull out in 2020 but said earlier this year it would keep up its role until 2024. Roscosmos and NASA "do not rule out that the station's flight could be extended," Komarov added. "Its term of existence will depend on the implementation of our joint projects," Komarov said. Russia had said earlier this year it planned to create its own space station after 2024 using its modules from the ISS after it is mothballed. Russia's deputy prime minister Dmitry Rogozin, who oversees the space sphere, appeared to downplay Komarov's comments on Saturday. 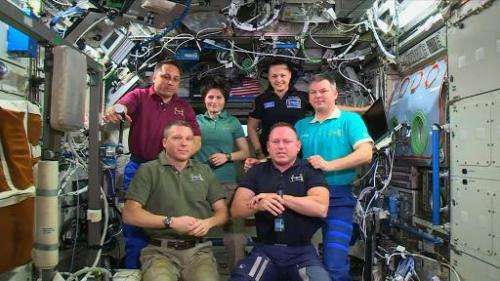 "The Russian government will study the results of the talks between Roscosmos and NASA. The decisions will be taken later," Rogozin wrote on Twitter. Late Friday, a spacecraft launched successfully carrying Russian and US astronauts to the ISS, two of whom will spend a historic year-long term on board in an experiment to study the physical effects of long-duration space missions. I hope they plan to do more than just science this time. Keep the ISS running, and build a large wheel shaped station in high orbit, using the ISS as a way station. We all spent the money to build it, so a colossal waste to ruin it. We can use EM drives or Ad Astra's VASIMR to keep it up there forever if need be. Make the new one we build BIG enough of a wheel for it to spin generate one 'g' of synth gravity and not make the crew dizzy. That and enough shielding for sol storms and incidental rad. Observations can be done in the hub, center of traversable spokes with elevators to the hub...at least one elevator anyway. Station keeping easily done with shawlor EM drives like the Chinese know now how to make. Shuttles with those same drives can be used to return to earth and back to build it at less than 100 dollars a pound if we use nuclear electric for power to the thrusters that generate a tonne of force/killowatt of power applied. New station can be used to build intersystem ships for travel/prospecting/asteroid mining. The major reason to build the ISS was to learn how to build and operate such complex structures in orbit. Various construction methods, systems operations, and materials performance could be tested safely in LEO with the idea that such structures will eventually operate in more remote and inaccessible locations. Imagine for instance if the suit water leak problem had been discovered in a ship half way to jupiter. Perhaps the next iteration will have the ability to be reconfigured and retasked, in whole or in part, as an actual vehicle, able to leave earth orbit for relocation elsewhere. VASIMR engines are scheduled to be attached to the ISS within the next few years. Maybe is time to think about space station on the moon, with similar equipment as on space station and with large telescope, similar or better than Hubble. Hard to say what the design life of various systems and materials are. Will seals soon start to fail? What about metal fatigue? Are radiation, thermal expansion, and micro impacts critically degrading cladding, fasteners, coatings, and windows? None of this hardware is built to last forever nor meant to be tested to failure. Osiris1; I think you have see the movie "2001 A space odyssey" too many times. MTBF/MTTR issues indeed...This offers great experience in respect of ongoing craft maintenance. ISS has been a great joint effort & with well prepared documentation in order for it to be an international project eg connecting the various modules with those seals which each contributor has precise specifications. Russia had said earlier this year it planned to create...using its modules from the ISS.. Extending to other countries offers many opportunities. As far as I know there was not even one breakthrough research result that revolutionized anything for last 20 years coming from $20+ $20 (maintenance) billions ISS as predicted by early skeptics except for propaganda of love among nations in space when war was being prepared on Earth. They should rather finance 500 small focused, cheap scientific missions, which brought already most of the knowledge about space. The ISS and Space Shuttle were welfare schemes for military contractors and NASA budget killers, cost thousands of scientists and engineers their jobs over last three decades. And now they want to repeat this with Russia. I thought that Russia is under sanctions related to Ukraine. That figures. The keyword here is "as far as I know" LOL. As you can see the list is very long indeed. Long term human space habitats, a mature technology? You must be joking. It doesn't even matter what they do up there, just living there and measuring what happens to the Astronauts pays for the whole trip, in terms of research data. Want to go to mars some day? It's going to take at least 6 months to a year to get there, what is that going to do to the human body? Want to put up space stations that mine asteroids? How long is the longest safe time you can have inhabitants at the station without artificial gravity, even if that's possible, or if you can just use a big hamster wheel to induce gravitational force, etc. The other stuff they do up there is just icing on top of that data. Did anyone read about the 3-D printer they sent there, and how they just emailed them a tool to print when one was needed? Or the effects of zero G on manufacturing or plant biology, or inflatable living spaces that a private firm is testing using the existing public ISS as a starting launching point? So much use out of this public enterprise.